High-Pressure Timer Switch - Micro-Air, Inc. The High-Pressure Switch Timer Control provides the necessary shutdown time delay before the compressor is restarted. This protection is not often provided by a standard HVAC control system or by a standard thermostat. It replaces the solid-state/DIP switch timer in the compressor contactor circuit with a much more versatile and programmable device. 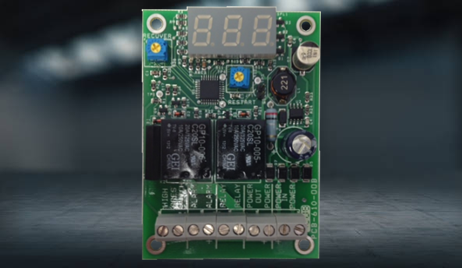 Powered from 12-24V AC or DC, the High-Pressure Switch Timer Control provides three dry-contact outputs: a pilot-duty alarm and two 10A power relays.